The day before my group scheduled an afternoon trip to Binondo, I asked my foodie friends where their favorite hole-in-the-wall is in the area. I'm not too keen with the hidden gems around Chinatown, although I've bookmarked some places already from my fun experience at one of Carlos Celdran's walking tours. 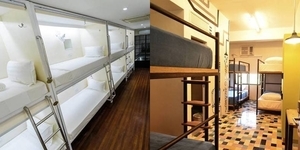 Celdran Tours Series: All The Way Down To Chinatown and Quiapo! 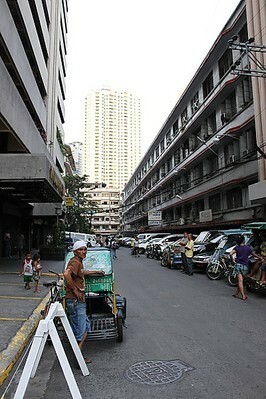 Join Carlos Celdran on his 'Walk This Way' tours, through this ClickTheCity.com exclusive. 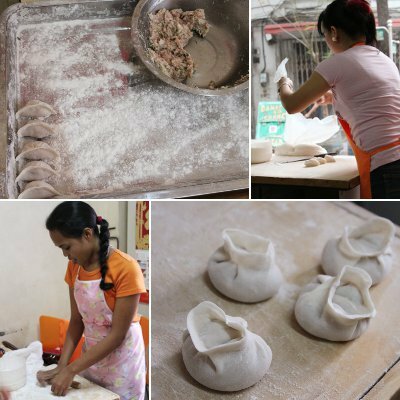 In this episode, Carlos takes us through Binondo, Manila's Chinatown, then through the crowded streets of Quiapo. Several friends recommended Dong Bei Dumpling for their, well, dumplings. 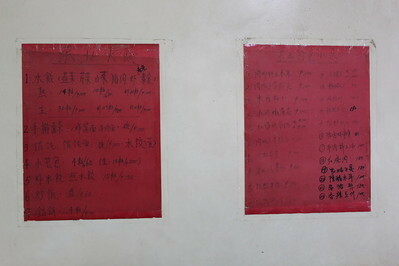 Earlier in the morning of the day of our DIY Binondo tour, I was informed that Dong Bei was closed. Good thing we still passed by its street later on in the afternoon before we wrapped up our tour, as it was open (they are open from 10am to 10pm by the way). If we hadn't, we would have missed out on discovering the perfect little hideaway that offers a no-frills, just good eats style of a dumpling experience. Upon stepping foot inside this little store, a big grin spread across my face. No customers were inside (I'm guessing since it was past 4pm, a lean hour), and right beside the tables were two ladies rolling meat into little balls. When I mean beside the customer tables, I mean it, literally. They have their ingredients spread out, and another table just by the entrance was decked with more meat, dough, a rolling pin and a knife. It's like we entered the kitchen of the restaurant, and we're going eat right beside the cooks. My companions and I were immediately charmed by Dong Bei's homeyness. Equally charming were the two ladies (cooks-slash-waitresses if you will) that welcomed us inside the humble little dumpling place. They were all smiles -- seating us, handing us their menu, then going back to work with making dumplings just a foot away from us. Atop their refrigerator, a small TV was tuned in a local channel, with a handful of teen talents singing to a swooning crowd. The vibe here was very relaxed; if you can imagine siesta time inside an air-conditioned kitchen of a tiny dimsum place, then that would be it. No overwhelming kitchen smell though -- none of that stick-in-your clothing fried food smell. 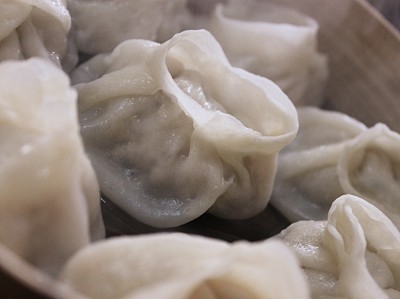 I know there are types of eaters that might get turned off by the seemingly amateurish and unaesthetic appeal of Dong Bei Dumpling. But I'm part of the foodie pack that celebrates those hidden and rough gems found off the beaten track. Aside from its absolutely-no-frills appeal and commendable waitstaff, another reason to come back is for their very affordable eats. 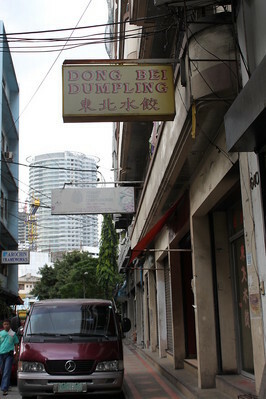 Come to Dong Bei Dumpling with 100 Pesos and you are guaranteed a good meal. 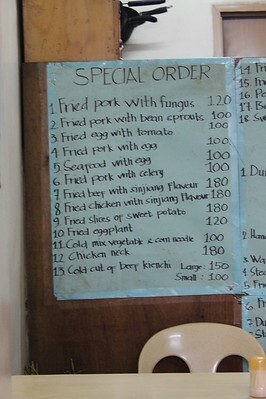 We were a group of four when we visited the restaurant, so we decided to share our orders for merienda. 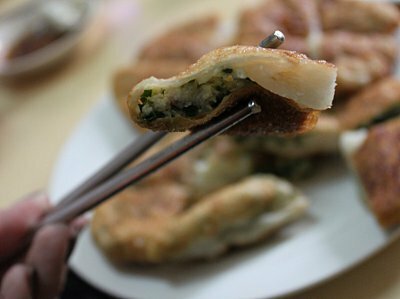 We got ourselves mixed dumplings, two kinds of fried stuffing pancakes, and xiao long pao. Tea all you can -- it's free! 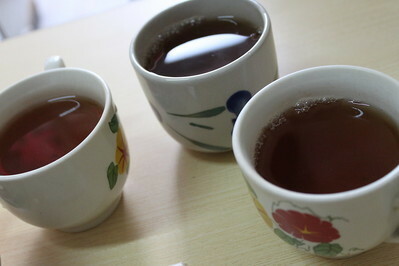 Before tasting out food, we were all served complimentary house tea. 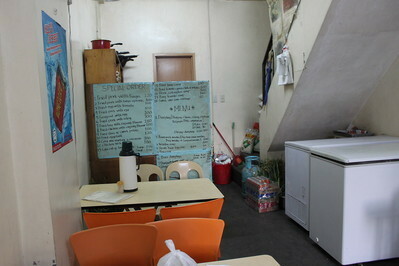 "Parang nasa bahay lang (just like you're at home)," one of the waitresses says with a smile, serving each of us a cup. 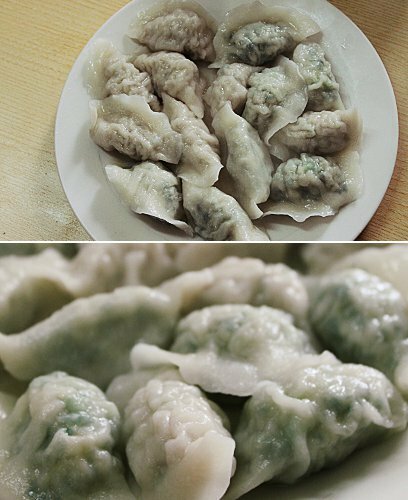 Our plate of mixed Dumpling (P80 - 10 pieces, P100, 14 pieces) arrived first, freshly cooked. We ordered it mixed, so we had 7 pieces each of pork dumpling and kuchay dumpling. The meat stuffing inside consists of celery, cabbage, bell pepper, and pork. 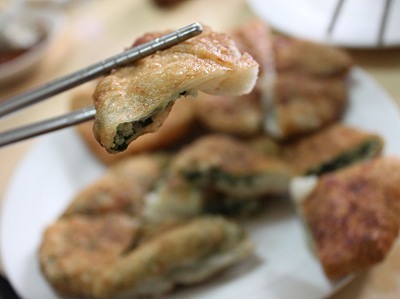 The plain dumpling is all soft meat in the inside. When you bite into the little dumpling, you can tell it's a fresh batch because of the give of its white translucent wrapper. I like dunking it multiple times on their dipping sauce to add that tangy layer of flavor. The sauce is a mix of vinegar, garlic, soy sauce, and some other special spices or herbs that I cannot distinguish -- all my tastebuds know is that the mix of the sauce is just right. I preferred the kuchay dumpling to the pork, as the veggie-loaded take has that more earthy, 'green' flavor. 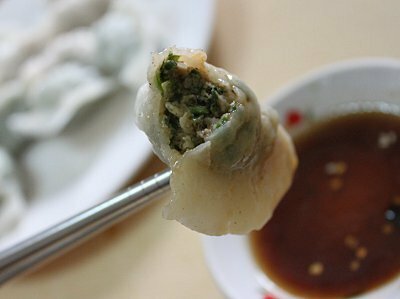 The taste of chives was prominent, giving the dumpling a more remarkably Chinese flavor. I let piece after piece of the dumpling swim across my little sauce plate, letting all the vinegary goodness of the soy vinegar sauce absorb. 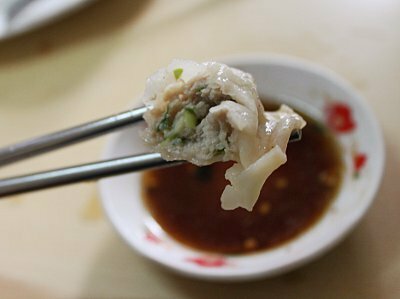 I popped the sauce-soaked dumpling into my mouth and let the dumpling's different juicy flavors and soft textures explode in my mouth. At P100 per 14 pieces? Definitely a steal. The next dish served to us were four golden deep-fried discs on a plate. The Fried Stuffing Pancake (P100 - 4 pieces) was such a flavorful discovery. If Japanese have their okonomiyaki, the Chinese have this. I just love its doughy, chewy texture on the inside that contrasts its crisp and light outer layer. Just remembering how it tastes like makes me wish that Binondo was just five minutes away from where I am right now. Just like their dumplings, I prefer the kuchai-laden ones than the regular meat (I simply find the Chinese leek/chive flavor appealing for my palate). We sliced the pancakes into fours, and pinched the triangle pieces with our metal chopsticks. They told us that the dipping sauce of the dumplings is also the sauce for this, so we obliged and dunked them into the savory brown pool. The chives colliding with the pork in my mouth in their chewy and moist glory was made more delicious with the zing of the sauce. It was highly addicting. Being that I rarely had the opportunity to walk around the streets of Binondo, I had no qualms of getting more than my equal share of the pancake (what shy piece?). Our two orders of Steamed Xiao Long Pao (P60 - 4 pieces) came in last. Our stomachs were nearing their satiation point, and that's just food worth P200 for four people. 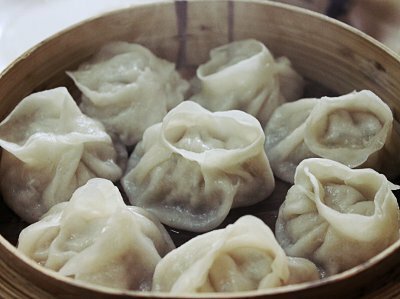 Eight pieces of plump little dumplings stood before us on a bamboo steamer container, waiting to be gobbled up. I gently scooped one from its bottom with my spoon and nibbled my way to the warm, soupy part of the dumpling. I can't claim it's the best I've tasted --I've yet to try other popular ones in the metro -- but Dong Bei's version of the soup filled dumplings are freshly made, served quick, and are amply stuffed with enough meat on them. 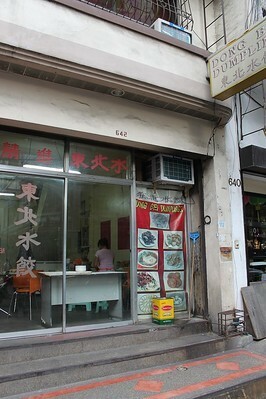 And for 60 pesos per order, it's a cheap comfort food of choice when you find yourself in Binondo. And just adding a little of their chili oil to the soy vinegar sauce to dunk in the xiao long pao -- instant flavor enhancer! 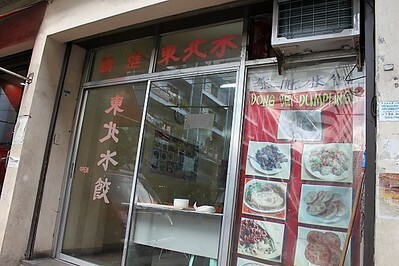 Finding Dong Bei Dumpling is easy when you are coming from the Plaza San Lorenzo Ruiz. Just look for McDonalds, and right across the fast food joint is V. Tytana Street (formerly Oriente Street). 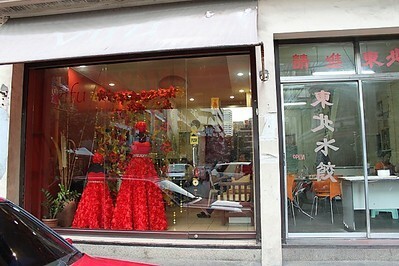 Walk till the end of this street and you will find Dong Bei, right beside Yifu, a dress and gown shop. If you're like me and rarely find yourself in the Chinatown area, this rough gem of a store that houses little dumplings that could is a must visit. You can also take home their dumplings and pancakes -- they sell them in frozen packs and are easy to cook. The dumplings, I was told, are just boiled rather than steamed. Dunk them in a pot of boiling water and in about 5 minutes, they're done. Add noodles if you wish, or transform your boiled water into a savory dumpling soup. 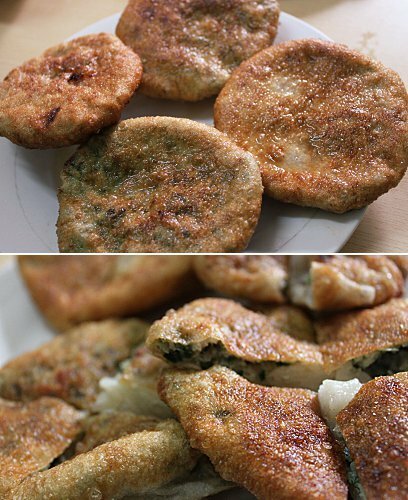 Try frying them too -- Dong Bei can serve their dumplings steamed or fried. I bought one pack of frozen dumplings (P100 - 14 pieces), and I can't wait to have a taste of Dong Bei at the comfort of my home.